When I first started blogging, one of the first things I did was to join the Amazon Associates program (Join HERE). My blog is still in the baby stages, and I’m not consistently making a profit (yet!) but my Amazon affiliate earnings have definitely been my biggest success thus far. 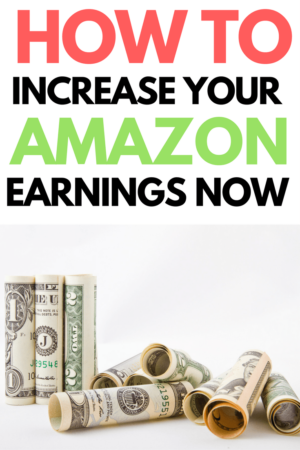 My Amazon earnings have been pretty consistent and I’ve been working hard to learn all that I can about how to increase sales on Amazon with their affiliate links. I love Amazon, I order the majority of my household items from this site. I am a prime member (in two countries ha! ), and an audible member. Seeing as I buy most of my things from Amazon, it seemed like an obvious affiliate for promoting the products on my blog. OH and guess what? Everyone else loves Amazon too! Amazon is the largest internet retailer in the world. There are a lot of people like me who do a lot of shopping on Amazon every day. This is truly the beauty of the Amazon affiliate program because you get a commission when someone uses your link to buy ANYTHING on the Amazon site. One of the things that is so interesting about Amazon is that VAST majority of sales I have ‘made’ on Amazon were for products I wasn’t advertising. E.g. someone clicks on my link to a stroller fan and ends up buying bath toys. I STILL get a commission! This key fact is VERY IMPORTANT in understanding how to optimize your Amazon earnings. Your goal is CLICKs to your Amazon links! Conversion Rate: 10.13 % ** I think this is a pretty good conversion rate! IMPORTANT FACT: Of the 124 products bought using my Amazon affiliate links only TWO products were for things I was actually advertising. 1: Make your links BLUE. I see a lot of new bloggers who don’t make their links OBVIOUS on their site. Readers associate blue words with links. You can also add an underline if you want to really hammer home the point. If you don’t make your links blue, readers might not know to click them! 2: Do NOT include the prices on your Amazon link. These widgets are not a good strategy for Amazon affiliates. Someone may look at the item and say, ‘No WAY am I paying that price’ and therefore NOT click your link. However, if you don’t put the price a reader might CLICK to check the price and STILL say ‘NO WAY’ but then if they buy underwear, or socks, or paper towels, or WHATEVER on Amazon you still get a commission. 3: Use your own pictures. Where possible, using your own pictures tends to generate more clicks than those stock images that Amazon provides. 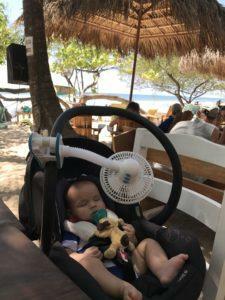 You can see this in my blog post “What to Pack for the Beach with Kids.” I get way more clicks on the images I provided than the stock Amazon images. Using your own picture = more clicks! 4: Use a lot of links. Sometimes I am reading a blog post about a product and I have to REALLY search hard in the post to find the link to buy the item. I try to put a lot of text links and image links in my posts so that users have no difficulty finding my affiliate link. to Canada I’ll be all over that too 🙂 It’s pretty easy not to sound too salesy when you genuinely like a product or service. This one is a bonus because Amazon One Link has not really benefitted me yet. Despite being Canadian myself, I just haven’t been able to get any Canadian conversions on Amazon and I actually now have to reapply for the Canadian associate’s program because it’s been too long without a sale. I did manage to get ONE sale on the Amazon UK associates program, and hey, I would have missed that $1.50 if I hadn’t otherwise signed up! Obviously using One Link is a good idea (sign up HERE), especially given that once you sign up it requires absolutely no work. I hope these tips were helpful in increasing your Amazon sales (and clicks)! If you have any tips for Amazon feel free to drop me a line in the comments below. « Airbnb with kids: The Best Way to Travel for Families?